Give your students the opportunity to shine — display your students artwork and highlight what you have been creating throughout the year. 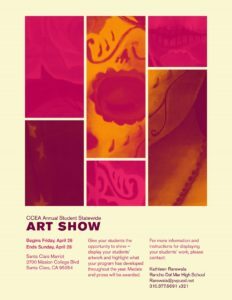 We will be featuring student artwork displays at the annual CCEA Conference, hosted in Santa Clara, California, on the weekend of April 26 – 28. This year, in lieu of prizes, students will be asked to donate their art work to be sold with all money collected going to those impacted by the Paradise fires. For Principals and Teachers: download this poster for the upcoming Student Art Show and Sale to put up in your schools and rooms for your students. The poster for the upcoming art show is student work from last year’s competition!